With a bit of encouragement from this clever little clip, a call for entries has gone out for the upcoming run of the traveling Bicycle Film Festival. A seasonal affair celebrating the confluence of velos and moving images, the primary requirement for consideration is relatively simple: a bike movie is a film or video "documenting, depicting, promoting and supporting bike culture in all it's forms." Films can be any length (though most of the BFF entries are of the shorter variety and run under 10 minutes), and entries are accepted in DVD or miniDV, NTSC and PAL formats. There is no submission fee. Each year the festival assembles programs of both short and feature-length films for a series of events around the globe. While there are often a number of elaborate, studio-quality films with high production values, the meat of the festival's nightly programming consists of shorter and decidedly more gritty, DIY-style work. 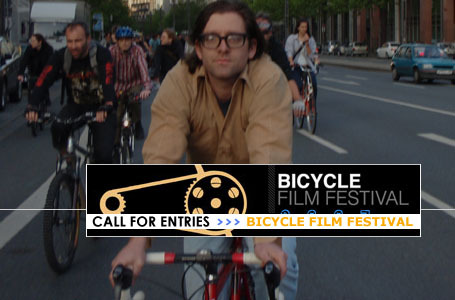 Literally anyone with a bicycle, a camera and a story to tell can be considered for the festival's film schedule, which varies from city to city. Though the entry deadline is frequently extended (perhaps having subconsciously adjusted to the tranquil cadence of two wheels and/or the relaxed schedules of bike shop life), the festival has been running a tighter ship every year so potential entrants are advised not to dilly-dally; to be considered, send off your projects in time to meet the posted February 17th deadline. The dates for this year's festival have yet to be announced, though the circuit has traditionally opened in New York some time in the late spring, usually May, and run until the late fall. Unfortunately there are often only a few weeks of advance notice between an event and the dates being posted on the website, so it is best to keep your schedule open if you don't live in or near a major city. Though initially a small affair limited to New York, the Bicycle Film Festival has steadily grown in size and scope over the past several years. In 2009 the festival visited more than two-dozen cities in the US, from Orlando to Seattle and Boston to San Diego, with additional international dates in Canada, Switzerland, Portugal, Austria, Denmark, Italy, Japan, Australia and the UK. The BFF's expanding schedule has coincided with, and been fed by, flourishing media coverage; the festival has often been mentioned in the LAS news and Field Notes sections, and there have been an increasing number of features in publications such as Time, Vanity Fair, Good, Vogue, Interview, and even Marie Claire, as well as interview spots with creator Brendt Barbur on Spoiler Alert and The BBC. For more information on sending in a film for this year's event, check the festival's downloadable PDF form for submissions. For information on cities and dates for the upcoming year, stay tuned to the festival's website.